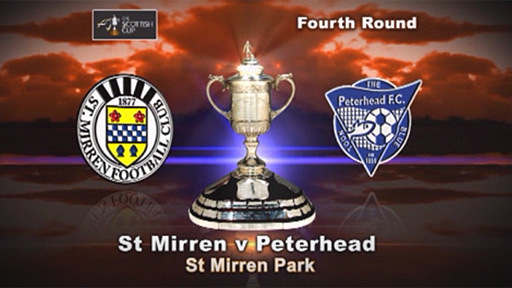 St Mirren will head to Balmoor Stadium for a Scottish Cup replay on 18 January after they and Peterhead failed to find the net in their fourth-round tie. The Buddies were unable to take advantage of Peterhead's defensive problems, the visitors losing both centre-halves in the opening period. Patrick Cregg hit the post with a firm shot on 14 minutes after his effort was parried by Peterhead's Jon Bateman. And Paul McGowan wasted a Saints chance when he shot over from close range. Peterhead were already without defender Daniel Moore going into the match, but worse was to follow when they lost both central defenders. Veteran Bobby Mann was carried off midway through the first half and he was followed by Scott Ross, who suffered a leg injury when he was on the receiving end of a powerfully struck free-kick. Danny Lennon's home side dominated for most of the match, but the part-timers, eighth in the Second Division, defended stoutly and the slovenly Saints could not find a way to score. Lennon gave a debut to midfielder Jim Goodwin and captain John Potter returned from suspension to take his place in defence. Cregg had several efforts on goal of various quality but came closest in the 14th minute after being set up by Craig Dargo at the edge of the penalty area. The Irishman crashed a shot off the base of Bateman's right-hand post, with David Donald clearing for a corner. Buddies midfielder Jure Travner headed a Goodwin cross past the post from six yards and the visitors had to replace Mann with Callum MacDonald. The home side continued to be wasteful, with defender Darren McGregor heading a Cregg free-kick over the bar from only six yards just before the half-hour mark. Bateman then saved from McGowan's header and, two minutes from the break, Peterhead had to make another change after Scott Ross blocked a McGregor shot, with the visiting defender carried off on a stretcher to be replaced with Paul Emslie. David van Zanten replaced the injured Marc McAusland for the start of the second half and, although the Paisley side continued to dominate, the goal looked no more likely to arrive. Lennon sent on striker Gareth Wardlaw for the ineffective Michael Higdon, but it was McGowan who blazed over from just inside the box after Bateman had punched a Cregg cross straight to his feet. In the 66th minute, as Peterhead were caught up the park for the first time, Travner broke down the left and cut in before curling a right-footed shot just past the far post, moments before Thomson sent a long-range drive wide. In the first minute of stoppage time, van Zanten threw in a cross from the right, Bateman made a fine fingertip save from Dargo's header and again the visitors defended the corner comfortably to earn a well-deserved replay. 90:00+3:10 The match has reached full-time. 90:00+1:31 Corner taken by Jure Travner, Callum MacDonald makes a clearance. 90:00+1:17 Headed chance falls to Craig Dargo, save by John Bateman. 88:45 Corner taken right-footed by Graeme Sharp from the right by-line, clearance by Darren McGregor. 88:32 David Ross takes a shot. Darren McGregor gets a block in. 87:16 Darren McGregor challenges David Ross unfairly and gives away a free kick. David Donald takes the direct free kick. 85:44 Jure Travner is ruled offside. Free kick taken by John Bateman. 84:47 Free kick awarded for a foul by Callum MacDonald on Gareth Wardlaw. Patrick Cregg takes the free kick. 83:49 Free kick awarded for a foul by Paul Emslie on Patrick Cregg. John Potter restarts play with the free kick. 82:49 Connor Gethans produces a right-footed shot from inside the area that clears the bar. 82:18 David van Zanten produces a cross, Callum MacDonald makes a clearance. 82:05 Free kick awarded for a foul by Paul Emslie on Patrick Cregg. Jim Goodwin takes the direct free kick. 79:49 Substitution Aaron Mooy comes on in place of Paul McGowan. 78:30 Substitution Connor Gethans replaces Nicholas Clark. 76:51 Jure Travner delivers the ball. 74:19 The ball is crossed by Jure Travner. 70:08 David van Zanten is adjudged to have handled the ball. John Bateman restarts play with the free kick. 69:21 Steven Thomson has a shot on goal from outside the box which misses left. 69:01 The ball is swung over by Jure Travner, Paul Emslie makes a clearance. 68:40 Corner taken left-footed by Jure Travner, Neil McVitie manages to make a clearance. 68:29 Shot by Jim Goodwin. Callum MacDonald gets a block in. 68:03 Inswinging corner taken by Paul McGowan from the left by-line, Ryan Strachan manages to make a clearance. 67:04 Darren McGregor gives away a free kick for an unfair challenge on Martin Bavidge. Ryan Strachan restarts play with the free kick. 65:46 Jure Travner has an effort at goal from just inside the box that misses to the right of the target. 63:28 Paul McGowan decides to take a short corner. 61:55 Unfair challenge on David Donald by David van Zanten results in a free kick. Callum MacDonald takes the direct free kick. 60:34 Unfair challenge on David Ross by Jim Goodwin results in a free kick. Callum MacDonald restarts play with the free kick. 56:01 Jim Goodwin gives away a free kick for an unfair challenge on Nicholas Clark. Ryan Strachan takes the free kick. 55:02 Inswinging corner taken by Patrick Cregg, Effort on goal by Paul McGowan from just inside the area clears the crossbar. 54:01 Free kick awarded for a foul by Paul Emslie on Steven Thomson. Darren McGregor takes the direct free kick. 53:15 Substitution Gareth Wardlaw comes on in place of Michael Higdon. 52:37 David van Zanten produces a drilled left-footed shot from 35 yards that went over the bar. 51:31 Shot from 25 yards from Steven Thomson. Save by John Bateman. 51:22 A cross is delivered by Paul McGowan, clearance by Callum MacDonald. 45:01 Substitution David van Zanten is brought on as a substitute for Marc McAusland. 45:00+3:03 The referee calls an end to the first half. 45:00+1:56 A cross is delivered by Marc McAusland, clearance by Callum MacDonald. 45:00+0:21 Free kick awarded for an unfair challenge on Patrick Cregg by Neil McVitie. Michael Higdon produces a strike on goal direct from the free kick, comfortable save by John Bateman. 41:55 Substitution Paul Emslie replaces Scott Ross. 38:39 Marc McAusland gives away a free kick for an unfair challenge on Graeme Sharp. John Bateman takes the direct free kick. 33:06 Outswinging corner taken left-footed by Jure Travner, free kick awarded for a foul by Craig Dargo on John Bateman. John Bateman takes the free kick. 32:52 Jim Goodwin sends in a cross, Paul McGowan takes a shot. Save made by John Bateman. 31:26 Patrick Cregg produces a right-footed shot from deep inside the penalty box which goes wide of the left-hand post. 29:35 The ball is swung over by Paul McGowan, save made by John Bateman. 28:25 David Donald challenges Jure Travner unfairly and gives away a free kick. The ball is swung over by Patrick Cregg, Darren McGregor has a header from deep inside the six-yard box and clears the crossbar. 27:10 The referee blows for offside. John Bateman takes the indirect free kick. 26:43 Free kick awarded for an unfair challenge on Darren McGregor by David Ross. Jim Goodwin restarts play with the free kick. 24:13 Paul McGowan takes the outswinging corner, clearance made by Stuart Smith. 23:55 Patrick Cregg takes a shot. Blocked by Stuart Smith. 22:33 Substitution Robert Mann goes off and Callum MacDonald comes on. 21:33 Close range header by Jure Travner goes wide of the left-hand upright. 20:37 The ball is delivered by Graeme Sharp, save made by Paul Gallacher. 20:14 Free kick awarded for a foul by Jim Goodwin on Martin Bavidge. Ryan Strachan takes the free kick. 18:51 Michael Higdon fouled by Robert Mann, the ref awards a free kick. Free kick taken by Jim Goodwin. Corner from right by-line taken by Paul McGowan. 17:01 Free kick awarded for an unfair challenge on Nicholas Clark by Patrick Cregg. Neil McVitie takes the direct free kick. 15:46 Paul McGowan takes a outswinging corner to the near post, Shot on goal by Michael Higdon from just inside the area clears the crossbar. 14:43 The referee blows for offside against Darren McGregor. John Bateman restarts play with the free kick. 13:01 Shot from just outside the box by Patrick Cregg hits the post. Inswinging corner taken right-footed by Paul McGowan, clearance by Robert Mann. 11:57 Graeme Sharp produces a right-footed shot from just outside the area that goes wide left of the goal. 9:09 Steven Thomson challenges Neil McVitie unfairly and gives away a free kick. Direct free kick taken by Robert Mann. 7:49 Patrick Cregg takes a shot. Save made by John Bateman. 3:50 The ball is crossed by Paul McGowan, save by John Bateman. 2:45 Marc McAusland sends in a cross, Headed effort from inside the area by Craig Dargo misses to the right of the target. 1:10 Free kick awarded for a foul by Craig Dargo on Graeme Sharp. Ryan Strachan crosses the ball from the free kick right-footed from left wing, clearance made by Marc McAusland. 0:48 Handball decision goes against Jim Goodwin. Ryan Strachan restarts play with the free kick. 0:14 Graeme Sharp fouled by John Potter, the ref awards a free kick. Robert Mann restarts play with the free kick.